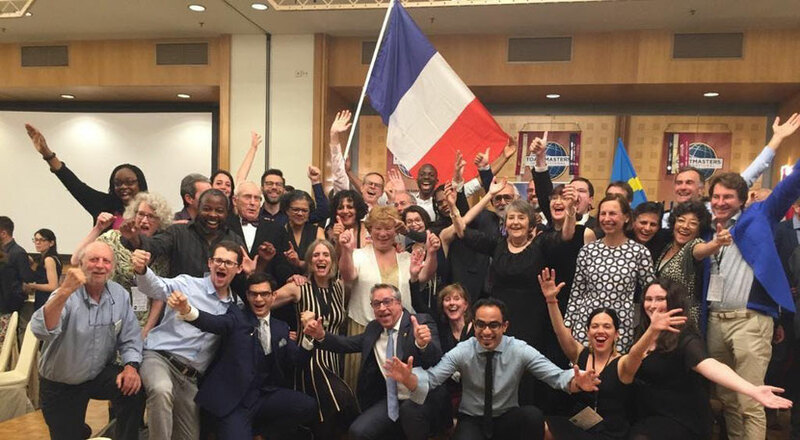 Welcome to Paris Speech Masters, a member of Toastmasters International, is an English-speaking club supporting people who want to become great communicators. You do not need to be a native speaker to join us. Our members come from different countries and speak with different accents. However, an excellent command and comprehension of English is a prerequisite. Our motto: Where Good Speakers Become GREAT!! Our club was founded on 29 June 2011. 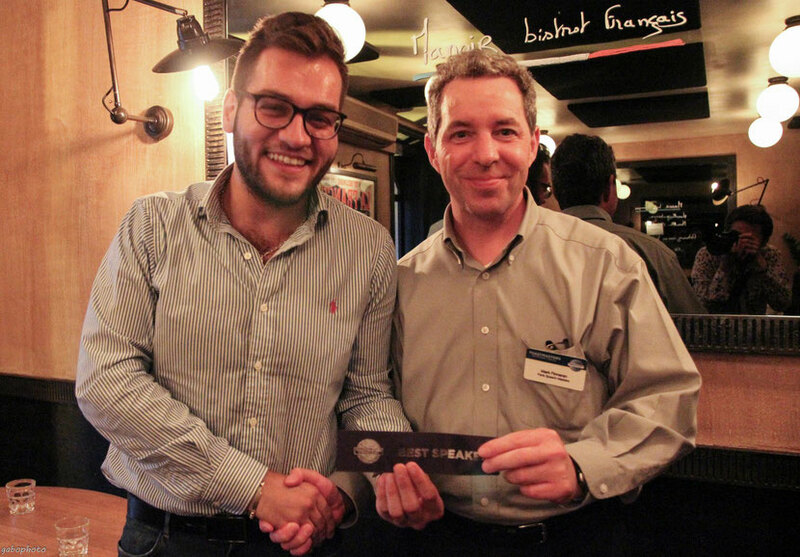 We have more than 25 members with more than ten differents nationalities. We belongs to the Area 4, Division A and District 59, part of Toastmasters International: the organization that offers you a place to learn how to formulate, express and sell your ideas with confidence. Toastmasters is the best way for anyone — whether a working professional, student, stay-at-home parent or retiree — to improve his or her communication and leadership skills. Members overcome the fear of public speaking and learn skills that aid them in becoming more successful. Toastmasters creates better listeners and stronger team members and leaders who can comfortably give and receive constructive evaluations. 1. Develop better speaking and presentation skills. 2. Learn to think quickly and clearly on your feet. 3. Hone your listening skills. The Toastmasters experience also helps you develop your leadership skills, practice skills from time management to team building. Once you’ve completed these programmes, you can continue onto the Advanced programmes. 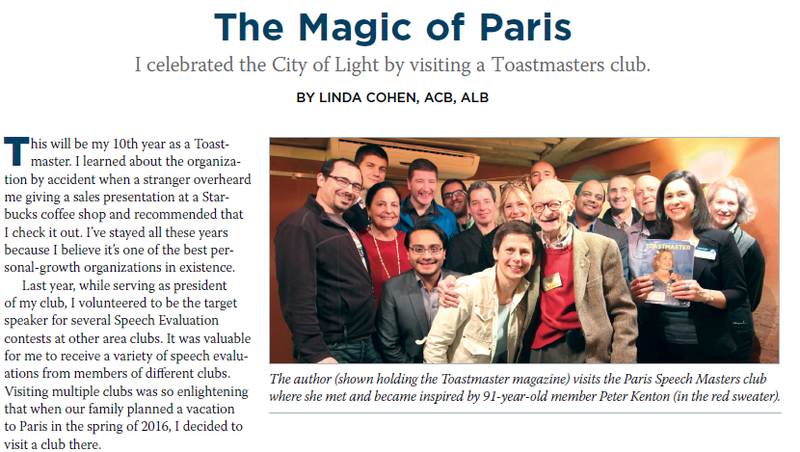 How does Toastmaster work ? 1. Conduct meetings: Members learn how to plan and conduct meetings. 2. Give impromptu speeches: Members present one- to two- minute, impromptu speeches about assigned topics. 3. Present prepared speeches: Two or more members present speeches based on projects from manuals in Toastmasters’ proven communication and lead-ership programs. Projects cover topics such as speech organization, vocal variety, language, gestures and persuasion. 4. Offer constructive evaluation: Every speaker is assigned an evaluator who points out speech strengths and offers suggestions for improvement. 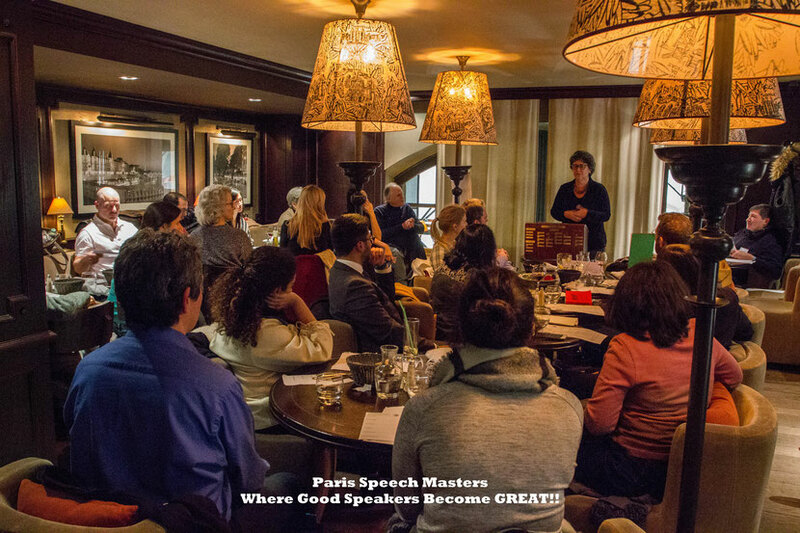 How does Paris Speech Master work ? The President or the Toastmaster of the Evening gavels the meeting to order, greets the guests introduces the evening's program. A "Toast of the Evening" is delivered. The Grammarian chooses a "word of the evening" challenging all speakers to use it during the meeting. The Toastmaster of the Evening introduces speakers to deliver their prepared speeches. The Table Topics Master announces a theme and calls on willing volunteers to give short impromptu talks. There is a break for dinner between the speeches and the evaluation session. This is a good time to get to know club members. Evaluators provide feedback for each speech, followed by reports from stumble catcher, grammarian and timer. The General Evaluator comments on the entire evening's meeting. The Toastmaster of the Evening thanks the guests for any comments, reports on any events or club business and closes the meeting. Interested in joining? Registering to visit a Speech Masters meeting in advance is just a few clicks away.